The pantry is a bit nostalgic, conjuring up simpler times. 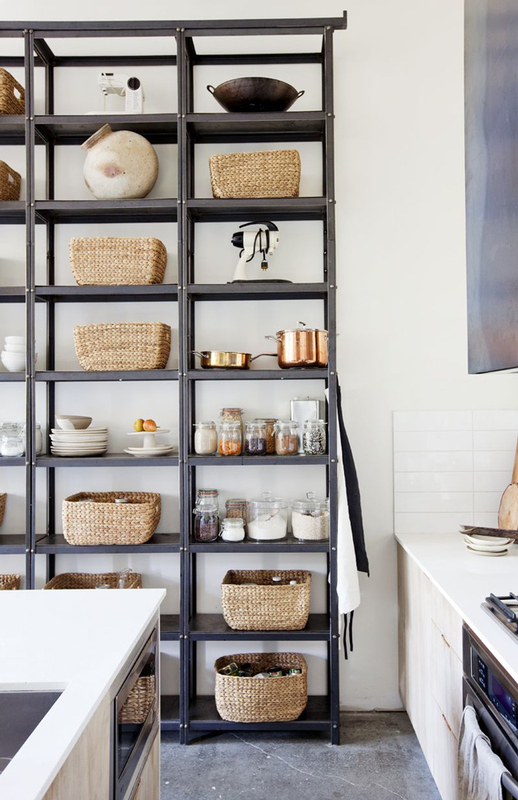 It’s a closet or walk-in space in the kitchen, or nearby, with shelves lining the walls from floor to ceiling. From canned to boxed goods, paper towels and other non-perishables, the pantry stores anything and everything these days. 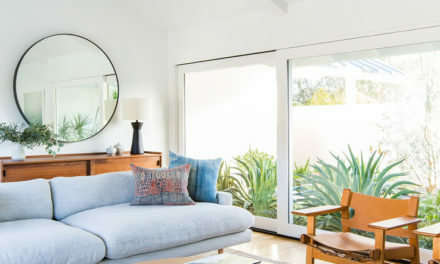 If people don’t have a pantry, they look to find space to create one — whether outfitting an old closet with shelving or designing a multi-purpose room, combining a pantry with a mudroom and laundry area. Others look to built-in storage — cabinets within the kitchen cabinetry — to solve their pantry needs, if they can’t borrow space from another room. 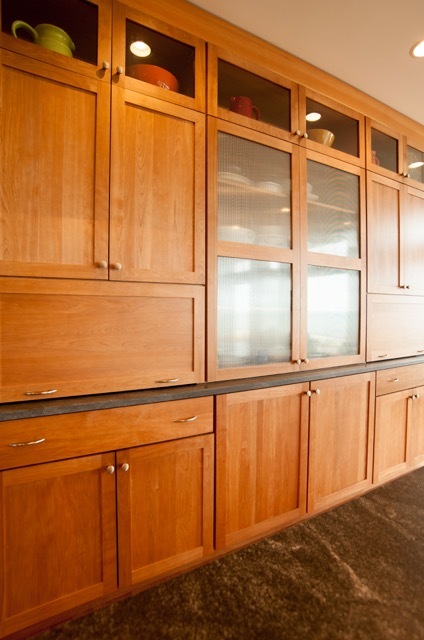 When someone is renovating a kitchen, we have ways of creating pantry space when it is desired. One recent project we did looked like a standard pantry cabinet from the front, but once the doors opened, it’s a step-in pantry. We borrowed 18 inches of depth from an adjacent space behind it and built wrap-around shelving inside. People want a kitchen where everyone congregates and where a lot of the main prep happens to be a much more open, naturally lit environment. They’re knocking down the wall between the dining room and kitchen, but it’s often too big of a space. So, we’ll create a walk-in pantry and bring the scale of the room back down to a nice size. If there are space restraints, we’ll combine areas. People sometimes want other functions such as a coffee or wine station or charging station. 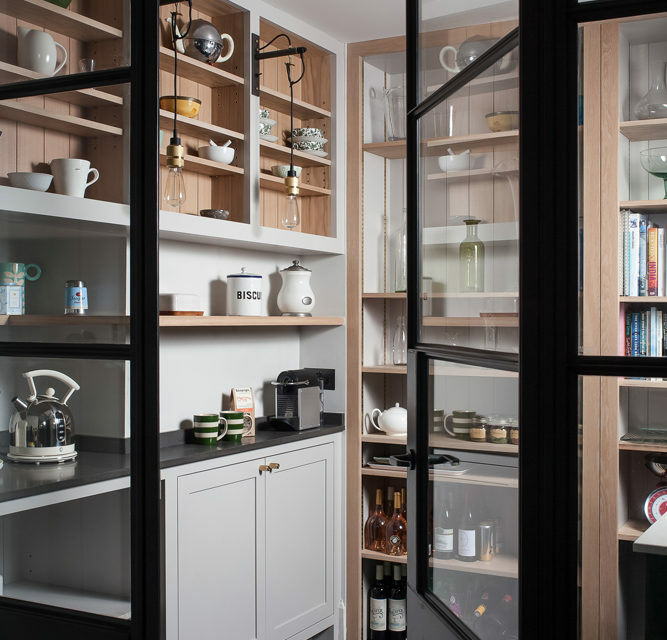 Within six feet of wall, we’re able to do a storage cabinet that acts as a pantry with an adjacent counter with a stack that has a coffee machine or a wine cooler built-in. Thanks to built-in appliances and roll out shelving, we’re able to make this happen. We’re also seeing a trend of placing a second refrigerator for food storage in the pantry. Today’s refrigeration is getting shallower in depth, so there’s less room unless you buy a wider style. But, then you’re taking up precious real estate in the kitchen. Pet food, big pots, bulky type items don’t lend themselves to clean, modern kitchens. Whether it’s a roll of paper towels or dog food it’s three steps away, but out of sight. The pantry not only makes a perfect place to store these items, but a place where the dog can eat too. It can serve a lot of different functions. 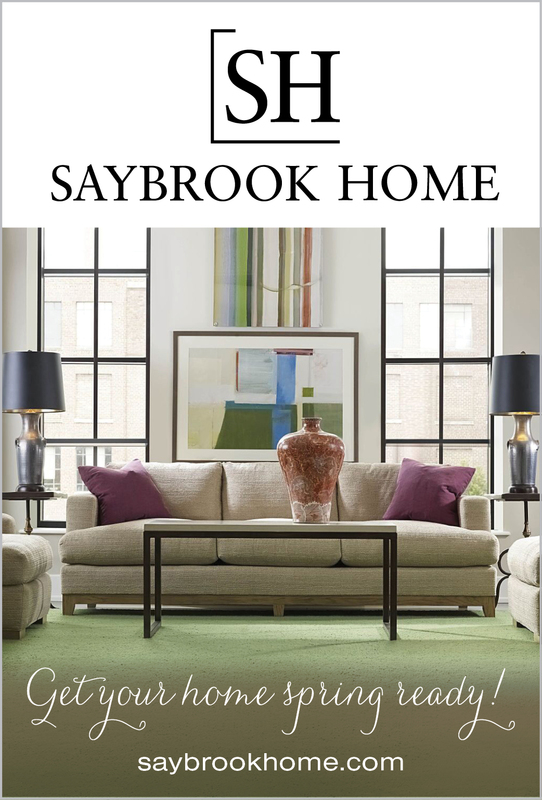 Imagine stepping into a room between your garage and kitchen, where there’s a place for your coat and shoes, a sink, washer and dryer, and cabinets for storage. This is how people want to live today. Everyone wants a space to store all of the “stuff.” Today’s pantry not only functions, but looks pretty good while doing so. 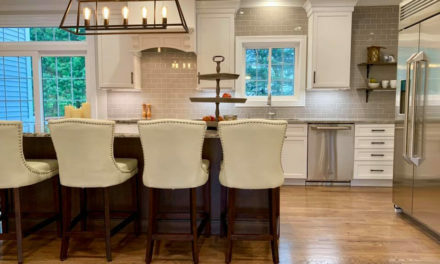 Rick Gedney is owner of Kitchens by Gedney, which combines the personality of a small, family-run business with the professional skill that comes with our cumulative experience of over 175 years in kitchen & home remodeling. 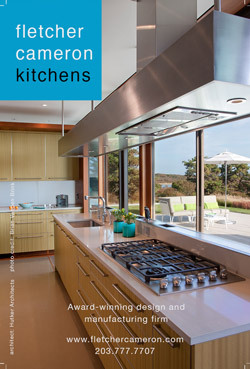 With the help of our dedicated design staff and installation team, we have created over 4,000 kitchens along the Connecticut shoreline, throughout the Northeast and beyond. Don’t Forget About the Plants!